Written By: Michael P. Nichols, Ph.D.
One person talks; the other listens. It's so basic that we take it for granted. Unfortunately, most of us think of ourselves as better listeners than we actually are. Why do we so often fail to connect when speaking with family members, romantic partners, colleagues, or friends? How do emotional reactions get in the way of real communication? This thoughtful, witty, and empathic book has already helped over 100,000 people break through conflicts and transform their personal and professional relationships. 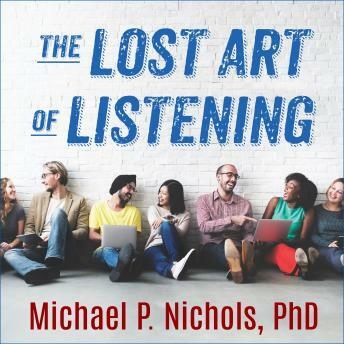 Experienced therapist Michael P. Nichols, PhD, provides vivid examples, easy-to-learn techniques, and practical exercises for becoming a better listener and making yourself heard and understood, even in difficult situations. by Michael P. Nichols, Ph.D.